The Monday night lecture at the Royal Geographical Society this week was given by Thomas Elmquist, Professor of Natural Resource Management at Stockholm University. Dr Elmquist spoke on the subject of the spiny forests of southern Madagascar. It was a fascinating lecture about a unique ecosystem of many endemic species which showed how the presence of human societies actually contributes to regeneration in this unique natural environment. 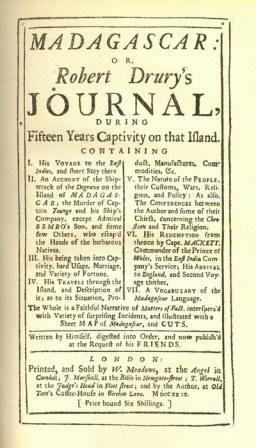 Whilst examining the historical continuities and changes within this particular region, Dr Elmquist mentioned an interesting source, a little known text which was first published in 1729, entitled Madagascar: or Robert Drury’s Journal During Fifteen Years Captivity on that Island. My interest was piqued and the following day I tried to find out more about this book and its author. Robert Drury (born 1687, died between 1743 and 1750) was a Midshipman aboard the Degrave, an East Indiaman which was wrecked off the southern coast of Madagascar in 1703. Aged just fifteen at the time, he and his fellow survivors were held captive by the people of Antandroy. Managing to escape they were pursued by some two thousand warriors. Eventually they succumbed and the majority of the unfortunate crew were massacred. Drury’s life, however, was one of only four, all of them young Midshipmen, who were spared. He was made a slave serving in the Antandroy royal household, eventually rising to a trusted position in which capacity he was later allowed to herd cattle and fight in battle. After many years he made a bid for freedom, journeying north-west towards another kingdom which was known to be more tolerant and accepting of Europeans, and where English ships occasionally called to trade and replenish provisions. He was hoping to be rescued by one of these ships but was again captured, this time by the Sakalava people, whose kingdom controlled much of the western half of Madagascar. Here his life was less harsh than before, and again he became a cattle herder, until he was eventually rescued by an English ship. He returned to London, but within a year he boarded a ship bound for Madagascar – ironically this time returning as a slave trader. In the three hundred years since Drury’s ‘Journal’ was first published scholars have debated the authenticity of the book. 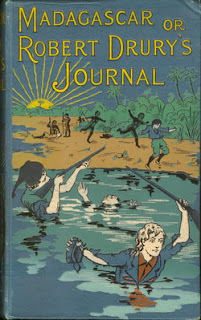 It had been published just ten years after Daniel Defoe’s novel, Robinson Crusoe, and some have seen the famous writer’s influence, if not his actual hand, in the work. Indeed, some maintain that Defoe may have helped to bring the book to publication as its editor. The case for the book’s authenticity has recently been strengthened by the researches of the British archaeologist, Mike Parker Pearson. Pearson has managed to show how the author of the book, despite all its embellishments and exaggerations, did indeed have a genuine and intimate knowledge of life, language, and local geography in these arid southern regions of Madagascar, and as such he believes the book can, on the whole, be trusted as a historical document. 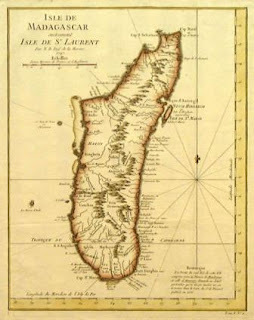 By a curious coincidence, my interest in far off Madagascar which had prompted me to attend the lecture, lead me to seek out the story of Robert Drury for myself – only to find the man much closer to home. For I discovered that each day on my way to work I walk past the church in which he is buried, St Clement Danes in the Strand. But, yet even more curiously, the day after the lecture I found myself walking to another RGS event, this time near Fenchurch Street, whereupon I turned a corner into Crutched Friars – the place where Robert Drury was born. 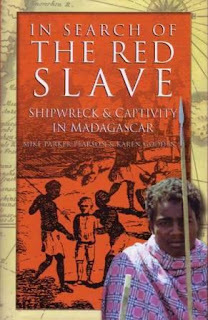 Mike Parker Pearson has published a book (co-authored with Karen Godden) entitled, In Search of the Red Slave (Sutton, 2002), plus several articles on his research into the life of Robert Drury and the corresponding archaeology of this part of Madagascar. Shipwreck into Slavery is a short article which appeared in the magazine, British Archaeology (Issue 67, October 2002). 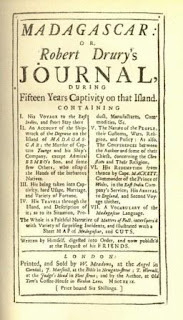 He also published a more in-depth article, Reassessing “Robert Drury’s Journal” as a Historical Source for Southern Madagascar, in the academic journal, History in Africa, Vol. 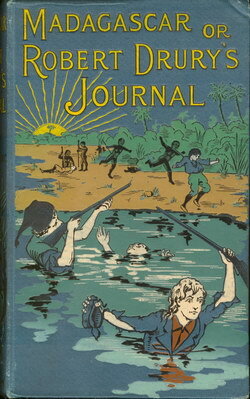 23 (1996), which is available on JSTOR . AFTERWORD (September 15, 2012): I'm now part way through reading Robert Drury's "Journal" and I thought I'd add my initial impressions of the book as a postscript (especially as it's not at present widely available). It's quite a dense and heavy tome, not helped by the fact that it is a single unbroken text. There are no chapters, it is presented as a continuous stream of direct reportage which goes into minute detail of the events it describes, almost as if it's reporting in real time! Consequently, I can see why some readers have questioned the authencity of the piece or speculated that it has been finessed by an experienced editor or co-writer. However, whilst it's not an inaccessible book, it flows well even for the modern reader, it does demand some concentration and sustained effort - it's not a book to be dipped into lightly, but rather it requires some stamina and time in order to derive the best effect from reading it. The edition I am reading (borrowed from the Library at SOAS) was published in 1890 and consists of 398 pages of quite small tightly packed type. Appropriately enough the book has stamps showing that it was once owned by Stoke Newington Library. I used to live in Stoke Newington, and I used to use the old Library on Church Street regularly. One of Stoke Newington's most famous former residents was Daniel Defoe. And his tombstone (salvaged from some oddly obscure place) used to be on display in the Library's entrance hall, set in a glazed mahogany showcase it was the first thing you'd see as you entered the building. I've not been to Stoke Newington in quite a while, so I'm not entirely sure if it is still there, but if it is - it's well worth a look to the curious passerby.